Facebook friend John Bingham and I were texting about golf in his home town of Ayshire, Scotland. The idea of visiting this destination is fascinating and I hope to travel there one day but, for the present, what better way to learn about a place you want to go than through the eyes of a local? I therefore asked John to share his local knowledge right here on Golf for Beginners. John's blog is below. Enjoy! Hi folks, I hope you enjoy my blog about golf in Ayrshire...my name is John Bingham, I have caddied on some of the finest links courses in Scotland and I consider myself very fortunate to have done so. I caddied for Gary Player, Ricky Barnes when he was US Amateur Champion, at the British Seniors, Royal Troon, Turnberry Ailsa, Loch Lomond, Western Gailes, Glasgow Gailes, Old Prestwick and Dundonald Links, loved every minute of it. My friend Stacy Solomon, after a few conversations, asked me to write a blog, so... Here we go! Ayrshire is a small county (state) on the west coast of Scotland; it's approximately seventy miles long by thirty miles wide. There are forty-four golf courses in my wee county, some very famous links courses, some not so famous but...still great tests of golf, plenty of parkland courses and some that are a bit of both. Eighteen holes, twelve holes and nine holes ...we have them all. I suppose it would have to be with the two most famous golf courses, Royal Troon and Turnberry Ailsa, As I have said, I've caddied on both, and can positively say they are fantastic courses! Old Prestwick is another great name, founded in 1851 - it hosted the first open in 1860. 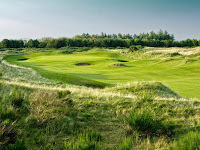 Other notable courses in Ayrshire are Irvine golf club and Kilmarnock Barassie, along with Glasgow and Western Gailes ...all have been open qualifying courses at one time. Dundonald Links is the youngest of our links courses. After a bit of redesign by Kyle Phillips, Dundonald opened in 2003 and has hosted a few top class competitions, more notably this years Scottish Ladies Open, where a lot of the worlds leading professional players attended. This well-known links course is hosting next year's British Ladies Amateur tournament and is being heavily touted to host the 2017 men's Scottish Open. Links courses are, by tradition, known for tight fairways, small greens heavy rough and pot bunkers. Dundonald has wide fairways, big greens deep bunkers and areas of rough in which you wouldn't look for your children, never mind a Titleist Pro V! Our golf courses will give all levels of player a test of ability... and that's without the weather. We have a wind that picks up and drops in a split second, you may even get all four seasons in an hour over here!! I think that, with the history of a visit to Scotland, and particularly Ayshire, it all adds up to a great golfing experience. Decent roads make journeys to all the golf courses fairly quick so travel is easy. Trains run from Ayr-Glasgow every half hour. Edinburgh and the East Coast are only just over an hour by car. Accommodation is plentiful and reasonably priced. Ayrshire is not all about golf though - we have some beautiful scenery here. 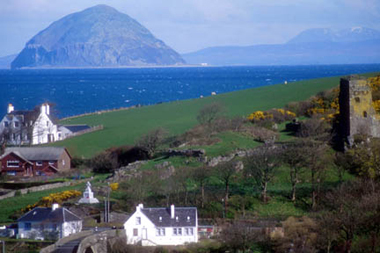 The island of Arran sits just off of our coastline and is a mini highlands with virtually the same landscape as up in the north of Scotland - it has seven golf courses, a whisky distillery (Arran Single Malt) and a brewery (Arran blonde or dark beer). Arran has a lot to offer! People of New York and the USA, come on over to Ayrshire - come and play golf, taste our food, drink some of our world famous scotch whisky and beers. Look at our history...Culzean Castle has an apartment dedicated to general Eisenhower, who lived there for a while and there are over forty castles here, most of which you can visit. And, if you come to Dundonald, just ask for 'Bingy'; it would be my pleasure to spend some time with you. Hope you enjoyed this. All the best, John Bingham. Have you ever played golf in Scotland or visited Ayrshire? Share your thoughts in the comment section of our blog or on Twitter @Golf4Beginners. After returning from a round of golf this week, my husband offered his usual outpouring of what he did right and what he could have improved upon from tee to green. I listened attentively (as all good wives do) and took a few notes to share with our readers. Together, we came up with a short list of basics which we all should remember but sometimes, as we we get caught up in the overall experience, tend to forget out on the course...in real life situations. These golf tips, because of their simplicity, should enhance your round and improve your overall golf experience. Feel free to add your own thoughts in the comments section of this Golf for Beginners blog - your notes could help improve someone else's game! 1. Eliminate three-putts. Get into the "circle of trust" when making longer putts (snuggle up to the pin) so that your next putt is an easy drop-in. 2. Choose the right club. Hank Haney once mentioned to me that beginners and amateurs rarely take enough club when moving the ball down the fairway. Click on the Haney link (above) to listen to the entire interview. 3. Don't go for low percentage shots. What is a low percentage shot? It's a shot that you aren't likely to make and where your downside is adding more strokes. An example of such a shot is when you are looking down the fairway to get as close as you can to the green but the fairway gets really skinny with traps or water surrounding it; don't try to go for it, Lay-up instead in a safe spot. Play smart - plan each hole. 4. Swing easy and let the club do the work. Don't rush your swing which is the tendency when you are excited or anxious. When you over-swing or when you swing too hard, you are much less likely to make good ball contact. What golf tips can you add to ours in order to play a better round of golf? Share in the comments section or on Twitter @Golf4Beginners. Is Golf Tiring for You? 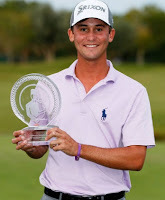 PGA Tour Rookies to Excite Fans. An article on CBSSports.com stated that "golf is sort of tiring right now" due to a never-ending season. Do you agree and what would you change to make golf more exciting for the fans? For many golf fans, it's the same old stories, from Tiger Woods' surgeries to whether or not Phil Mickelson still has game. As the new season begins with rookies to liven up the action, is that enough to increase viewership or, at least,m maintain the status quo? Or, could it be that fans need more than fresh-faced Tour pros to sink them into a comfy Stratolounger? Golf for Beginners believes that a combination of rookies heating up the course and new programming designed for millennials can save the sport from being relegated to a search for the leaderboard link on Sunday night or a quick flip to the News at Ten. Here are a few newbies we think will heat up the PGA Tour. 1. Smylie Kaufman: Earned his wings on the Web.com Tour and jumped right into the winners seat at the Shriners Hospitals for Children Open. Can shoot low on a Sunday, when the pressure is on. 2. Emiliano Grillo: Should be nicknamed, "Second Chance Grillo", feeling his oats early in the season with near misses and a season-opening rookie win. Gets into playoffs and gives himself chances; learning how to be a confident winner. Playing on the European Tour for five years, could already be considered a seasoned pro. 3. 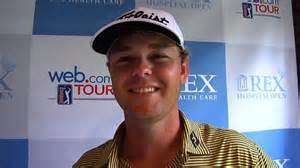 Patton Kizzire: Leading money winner on the Web.com Tour and already a top-five finisher in two events this season, a Golf Channel writer mentioned, "You may not know who Kizzire is now, but you will soon." Perhaps an increase in viewership won't come directly from watching tournaments or from rookies having break-out seasons but from new fluffy shows like "Celebrities in Golf Carts" or action-packed events such as the latest Big Break series? Only time will tell what millennials and beginners to golf will need in order to become attracted to, and to stay in, the game. Voice your opinion on Twitter @Golf4Beginners and on our golf blog! The New York Times published an article this week that the USGA is planning a five-year study on the challenges facing the golf industry, mainly on the player level. Topics to be covered include the cost of the game, the time it takes to play and golfer enjoyment. Since there is always talk about the closing of courses and how people are garaging their clubs, the USGA is making a concerted effort to reverse negativity within the sport. A few months prior, the USGA came out with a new and improved video-directed website designed to help educate all players understand the rules of golf. As we know, if golfers understand the rules, chances are they (and their partners) will have a more rewarding experience. The U.S.G.A. will partner with the University of Minnesota on the study but I say, let's bring questions to the people. "Why not also partner with groups on the internet?" "If you could offer advice to the United States Golf Association to improve the game on the player level, what would you say?" To improve golf for me, I would find a way to remove geese safely from the courses on which I play. There is nothing worse than having your ball land on goose poop! I would also ramp up ranger action to help speed up play for amateurs who either don't know or don't care about keeping the game moving. Here are a few answers from the golf group - U.S.G.A. take note! 1. Bobby Alford said, "Just lower the price. And stop making 7,300 yard courses." 2. Ciaran Campbell - "Rangers keeping a watch for slow play. Maybe some "tee by handicap" system to stop high handicap players playing from back tees during comps - it would probably help their enjoyment." 3. Gus Gurevitch - "The push for municipal monthly fees to return to all city owned courses. Most have disappeared." 4. Geoff Jordan - "Pace of play and play-ability should be the focus. Rangers and courses need to do more to speed-up slower players, especially in early rounds. They must TEACH and enforce "ready-golf" with slow players." Geoff continued, "Golf carts seems to make slow players even slower. If they can't speed-up, get them off the course. Play-ability - newer courses need to be walker friendly. Tee and greens closer together. Courses should standardize flag color/markings for front/mid/back pins along with yardage markers F/M/B. (it doesn't do me any good to know pin position 2 when the scorecard is 120 yards away with my partner in the golf cart. Let golfers know by flag color/markings when they are in the fairway." 5. SuzyFromFlorida mentioned, "...slow play is the killer. You can be the worst golfer ever and still play fast. But you have to be taught how to do it. A whole education process needs to be put in place, rules need to be set, and then enforced by rangers. Golf will become more enjoyable for everyone. Of course, this will never happen in our lifetime." What advice would you give to the U.S.G.A. to improve the golf experience? Feel free to post on this golf blog and tweet us @Golf4Beginners!